I don't know that I ever capitalized on Meghan Trainor's ear-buggy song, so I thought now was the time. I hate eggs, but I love breakfast. Something about good coffee, heavy, sweet food, and knowing I still have a whole day ahead of me is incredibly appealing. Sadly, I have yet to find something close to home to fill that void, but luckily, Houston is a huge city with tons of options a bit farther away. One Sunday, we ended up at Pondicheri for breakfast. It's an Indian restaurant and as someone who loves Indian food but has no idea what makes an Indian breakfast, I was a bit skeptical; I was craving pancakes that particular morning. The menu had crepes, which I decided was close enough, and so we went. For whatever reason, I thought that I would have three separate crepes, so I chose nutella, strawberries, and blueberries as my toppings. When one large crepe arrived, oozing with nutella, I was a little disappointed. It wasn't the restaurant's fault (I should have asked), and I do love nutella, but it's so overpowering, it's all I tasted. Fortunately for me, Andrew didn't realize how large even the side items would be, so we had many other things to try on the table. He got a Morning Thali. There was something eggy in the center of the plate, which I ignored, but the things in small metal dishes surrounding that were amazing - a chutney, some cooked carrots, and some lentils. I ate those on top of the aloo paratha that we ordered, which is a savory, pancake-like thing made from carrots and potatoes. It was delicious and satisfying in a way I wasn't expecting from breakfast. 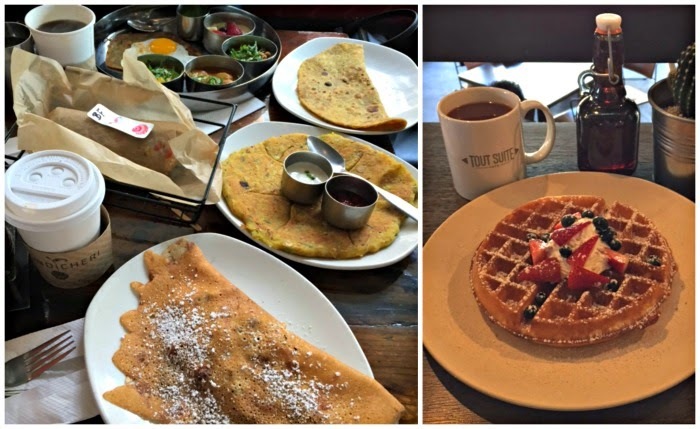 Another weekend, after trying two different places nearby unsuccessfully for brunch, Andrew and I drove into town to have brunch at Tout Suite. It's close to my office so I get coffee there often and have been for lunch, but this was my first brunch trip. I was craving waffles (pancakes' textured cousin), so my choice was easy. These were fantastic, and waffles are really easy to screw up. They were served with a little whipped cream and some strawberries and blueberries - no syrup needed. They were crisp enough to keep their texture under the toppings and had a different taste to them that Andrew identified as nutmeg in the batter. I was in love. Andrew ordered a Norweigan egg dish, which I even enjoyed a bite of. The eggs were on top of toast and topped with smoked salmon and blood orange creme fraiche - atypical of the norm of bacon and eggs, but still delicious. The Pondicheri spread, going clockwise from the top: the Morning Thali, a tortilla-esque bread thing perfect for the Thali accompaniments, aloo paratha, my dud of a crepe, and something else Andrew ordered that he thought was small but ended up being a burrito. | Tout Suite waffle - more amazing than it looks in the pic. A new donut shop just opened in town. The owners of one of my favorite food trucks has closed down (RIP, Shorty Mac) and focused its energy on breakfast. We had time to kill one morning, so we waited in line for 45 minutes to try the donuts and kolaches at Hugs and Donuts. I wasn't in the mood for sweets that day, so I ordered a spinach and artichoke kolache and a lox bagel kolache. The spinach and artichoke was good - flat, with the toppings in the center. The lox bagel kolache was round, with the same toppings as an everything bagel over the top, a dollop of cream cheese in the middle, and a piece of smoked salmon folded over the whole thing. It was good, but not as good as I remember the Everything Kolache from last year's Fluff Bake Bar pop-up being. While Andrew was out eating barbecue one Sunday, I made plans with friends to check out Lowbrow. I had no idea what to expect, but basically this place was hipster paradise. There was a random western playing on a projector screen and a DJ spinning everything from 80s new wave to 90s hip hop. It was open air (and the weather was fantastic) and tons of weird, Houston-specific kitchsy things adorned the walls. I loved the atmosphere and would go back for that alone. 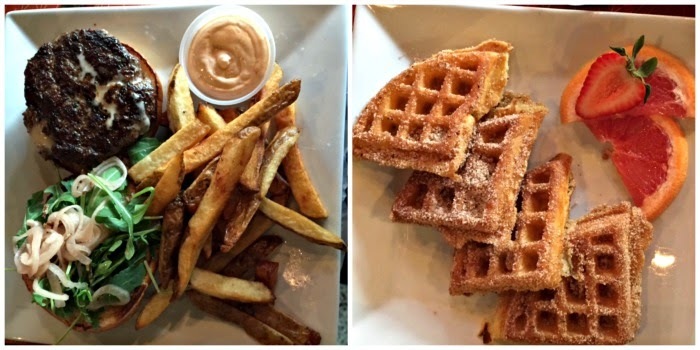 My friend and I shared the special Juicy Lucy burger - stuffed with fontina and topped with arugula and pickled onions - and the churro waffles (just call me Lauren Knope). The burger was great and worth a return try, but the waffles lacked the aforementioned crunch I adore. It was just a fun place, though - definitely a great spot for a little hair of the dog after a rough Saturday night. Juicy Lucy | Churro waffles, chocolate sauce topping not pictured. And, since drafting this post, I realized I've eaten waffles twice more - on back-to-back days, no less. Since I was driving out to the southeast side of town, Sarah suggested that we meet at Seabrook Waffle Company. This place only serves waffles topped with all kinds of things and instead of being made with batter, the waffles are made with dough. I wanted something from the savory side of the menu, so mine had peach preserves, bacon, and gorgonzola cheese. I know it sounds weird, but the sweet/savory thing worked really well. I could have lived without the bacon, though. Sarah's waffle had mac and cheese with red pepper flakes and it was good, too. The next day, I had a pecan crusted chicken with a waffle and molasses cream sauce at Pecan Creek Grill, which I have talked about many times. The chicken was great and the waffle was fine, but the cream sauce was kind of awful. I used it sparingly, mostly because I was too lazy to go get myself syrup. Having to go into town for good breakfast is definitely a first world problem, though one that I wish my suburb would remedy. Who wants to start a diner in northeast Houston? Perhaps we can name it JJ's? I love breakfast (at any time of the day). And I love the idea of brunch. But I just cannot convince myself to get dressed and leave my apartment on a Saturday or Sunday just for brunch. ;) Maybe I need to make a brunch date with some friends, that would probably motivate me. I love breakfast. It's my favorite food. I could eat it all day everyday. Eggs are a huge staple in my diet. I'd be lost without them. I wish we went out to breakfast more. Great, now I want a waffle!! Sounds like you and A's next adventure, a bbq inspired breakfast place perhaps? :) I've never had Indian breakfast, sounds so interesting. I so want to try a kolache, they sound so good! I don't go out to breakfast near enough. The waffles in the last picture look so good! I tend to go for French Toast so the waffles would be a good switch. brunch is my favourite. i love breakfast food. my girlfriends and i try to get together like once every couple of months (sounds way worse than it is, but that's life) and i eat ALL the food. next time i'm getting waffles haha. YUM all of your photos just make me want to eat all of it haha. I don't think I've met a breakfast food that I don't like. I like eggs, but people who put hot sauce on them make me side-eye them all day long. BLEGH. Brunch is heaven on earth. I never tire of it!! And nutmeg in the batter is ALWAYS great for breakfast goods. My dad has always done it and it's a very slight, but delicious difference.